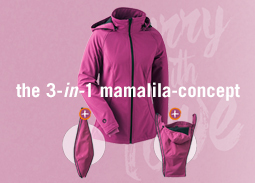 With the mamalila men's babywearing jacket dad can also easily carry baby inside his jacket. Whether it's hiking, taking the dog for a walk, or, going on a great adventure through the snow! 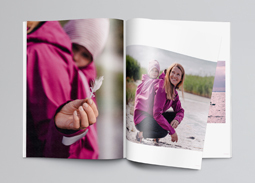 The high-quality, sporty functional jacket which is made from flexible softshell, is breathable, wind and waterproof, has generous pockets and a sophisticated babywearing insert with integrated head support function. Order your normal size only, children (up to 1,5-2 years) will fit in our babywearing inserts!